Beautiful Incentives: A Rustic Easter Candy Terrarium. Plus, a Giveaway! A Rustic Easter Candy Terrarium. Plus, a Giveaway! This sponsored post and giveaway is in accordance with FTC guidelines. 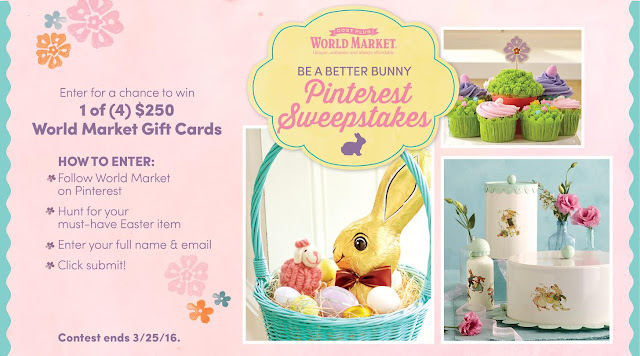 Easter is approaching again and as an ambassador, I am excited to pair up with World Market to give you an idea for your next Easter entertaining. The one thing I adore about any holiday is the chance to change my decor and make things really emanate that holiday. Easter is an excuse to get really cute and creative with animals and landscape. It's also a time to indulge in candy and I have fused the two together! One year I showed you my DIY Candy terrarium and this year will be a virtual idea on setting up similar with a Rustic theme that will fit any decor. It's elegant yet down home and perfect for a centerpiece or table settings. Everyone at your Easter get together can have fun picking at the Candy terrarium for their favorite candy, BUT the decor stays adorably in tact, because the majority isn't edible! There's just enough to satisfy that craving. Pictured above is all you need to get started. Shopping in store will ensure you can get exactly what you want and maybe at an even better price for your budget. 7. Sour Apple Gummy Laces for worms or grass. 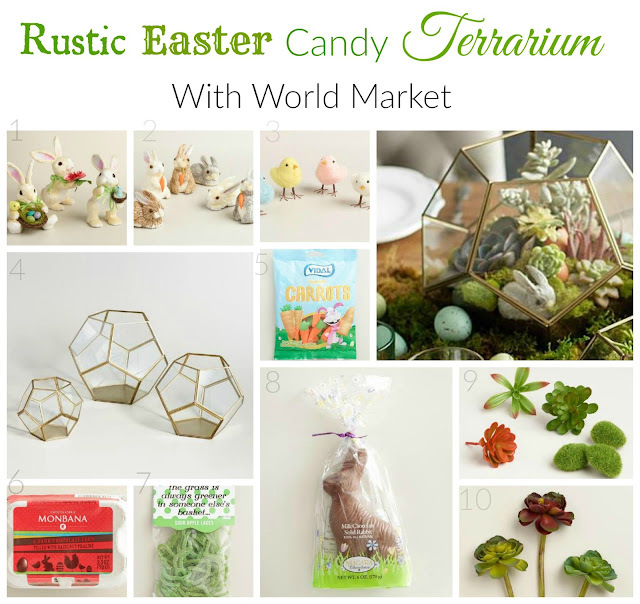 Keep in mind, these are just a few ideas out of a ton you can get from searching Easter products on World Market's website. The Rustic Candy Terrarium is so easy and can be used over and over again. It can also be transformed for another holiday or for beautiful every day decor. Terrariums are eye catchers and perfect for those who want to bring nature and gardening in doors. They're like mini worlds of your favorite things. World Market is offering 4 people a chance to win a $250 Gift Card to their store! 2. Then hunt for your must-have Easter Item and Pin it! Contest Ends 3-25-16. Good Luck! For more Easter Inspiration, be sure to check out these fun Ideas from other Ambassadors!